ACU’s Center for Speech and Language Disorders has moved to the Duncum Center, at the corner of East North 16th Street and Judge Ely Boulevard, and is now called the Center for Speech, Language and Learning at the Duncum Center. 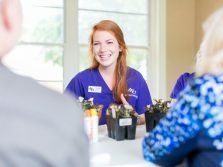 The conflict resolution graduate programs once housed in the facility, previously known as the Duncum Center for Conflict Resolution, have moved to ACU’s Dallas campus as part of Duncum Center Solutions. “This beautiful and functional building is well-suited to house the Speech, Language and Learning Center, and the location is much easier for members of our community to locate and access than the previous location in McKinzie Hall,” said vice provost Dr. Susan Lewis. The center, open Monday through Friday, provides evaluation and treatment services to individuals with suspected communication and swallowing disorders. Clients range from 18 months to more than 90 years of age. Additionally, the clinic provides special programs for adults with Parkinson’s disease, and an aphasia (post-stroke) recovery group. Each semester, about 50 graduate students in the Master of Science in speech-language pathology program are placed into a local clinical practicum. Around 10 of those students are placed each semester in ACU’s Center for Speech, Language and Learning. Three part-time clinical supervisors, one full-time supervisor/instructor, and the clinic director oversee their work. The Duncum family is supportive of the change in the use of the building. The Center for Speech, Language and Learning will host an open house at the Duncum Center from 10 a.m. to noon Saturday, Feb. 18.